Why You Should Write Protect USB Drives? To protect your data from being deleted,moved or replaced by children etc. To protect your drives with viruses. To stop thieves from stealing your data. To prevent from errors which appear on device start-up. 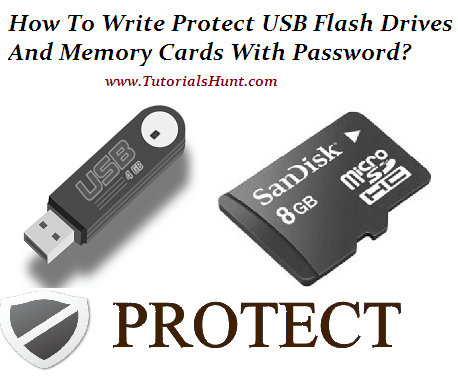 How To Write Protect Memory Cards And Drives? Extract files (which are in software) to a hard drive or memory card which you want to be write protected. Now open file ”Urcam” and accept the software agreements. Now click on ”Password” button located at the left below side of software. Now enter your desired password and click on save. Now set your USB Drive to ‘Read Only’ from software. Enjoy! Your drive has been write protected successfully! Thinking how to remove write protection of it? It’s simple just go to your memory card/USB flash drive and open the URCAM file and remove the write protection by following some simple steps.If you are facing any problem please watch the video tutorial below to get your problems solved! I tried my best to explain you each and everything about write protecting your important drives.I hope that you would have liked the video tutorial.Please share this tutorial to support us and comment if you are having any problem related to anything.We will try or best to help you.Remember us in your prayers! Script reinstall kr k dekho.Plugin user kr rahy ho koi?